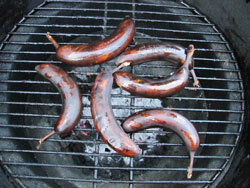 Two great grilled bananas recipes that will cook perfectly over dying embers at the end of your cookout. If you either an alcoholic or a chocoholic then you've come to the right place. Bananas and ice cream are a match made in heaven... especially when you add some banana liqueur. Sweet yet alcoholic, warm yet cold, there's so many flavour sensations going on at the same time. Special thanks go to Barrowford hairstylist Christian Smith for this great recipe. I was getting my hair cropped and while Christian happily snipped away and massaged a little “product” into my scalp, he shared with me one of his favorite barbecue desserts. I've specified banana liqueur in the ingredients list but don't worry if you don't have any. You can always substitute another fruit based liqueur such as Cointreau or Grand Marnier. It works just as well. Unless using homemade ice cream, check the ingredients label on the tub. Just throw the bananas onto the grill and cook until the skins are black all over, this will take about 20 minutes over medium heat. You'll need to turn them every 5 minutes or so. 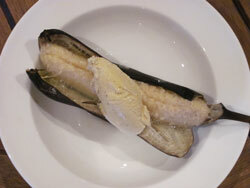 To plate up place one banana in each bowl and break the skin longitudinally with a knife along the inside of the curve. Take care at this point because the natural moisture in the banana can create a steam bubble that will cause the bananas to pop. Pull the skin apart so that it nicely displays the banana and gives you ample room to pop a scoop of ice cream in there as well. Drizzle with a liberal dose of banana liqueur and you're ready to serve. Melted chocolate bananas is the closest you’re going to get to banoffee pie on the barbecue and if you’re a true chocoholic then maybe melted chocolate bananas are the perfect way to end a BBQ cookout. The beauty of doing grilled bananas is that the skin acts as a natural protection from the heat of the grill so you can set a few off over a gentle heat while you enjoy your main meal. My wife is a real high cocoa solids chocoholic so dark chocolate is my normal source of chocolate but feel free to experiment with others and see what takes your fancy. TIP - When making the incision in the banana, make it along the “inside” bend of the banana so that there’s less chance of the melted chocolate oozing out. Please check the ingredients label on the bar of chocolate. Take a rolling pin and smash up the unwrapped chocolate bar to create lots of bits and pieces. Using a sharp knife make one incision down the length of each banana, gently ease the flesh away from the skin and then stuff the chocolate around the outside of the flesh. 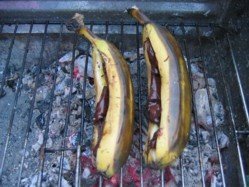 You can use a cocktail stick to shore up the incision in the banana skin if you wish and then simply place the grilled bananas over the embers and go and enjoy your main course whilst everything begins to soften. To serve, simply plate up the melted chocolate bananas, remove the cocktail stick and let everyone open up their little bundle of delight. 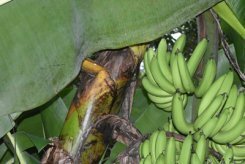 Whilst the cluster of banana fruit hang down from the flower, individual bananas actually grow upwards.